A German Reddit user took a picture of a particularly desperate in-store promotion at GameStop Germany. 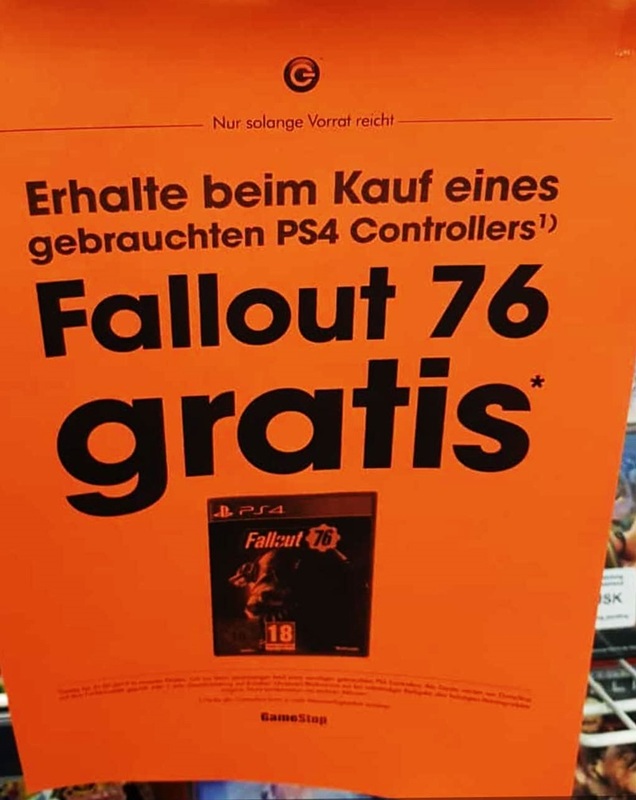 The banner simply states the store is offering free copies of Fallout 76 with any purchase of a used PS4 controller. Though this is certainly extreme, and could just be a case of GameStop Germany having purchased more stock than it was able to sell, it’s still telling that a major retailer would resort to these means to get rid of a game. Almost everywhere else, Fallout 76 has been discounted immediately after launch, both digitally and at retail. It’s certainly no secret that Bethesda’s latest game hasn’t been hot with players. Fallout 76’s beta, launch, and in the weeks that followed have been nothing but troubled. Even as far as this week, Bethesda continues to struggle wit game polish and balance, with the game’s most recent patch bringing back previously fixed bugs. Players have taken to making jokes at Bethesda’s expense any time new information about the game drops. Earlier in the week, many on Twitter ridiculed a $276 Fallout 76 leather jacket, a reference to Fallout 76’s now infamous collector’s edition bag bungle.